This is part two of a series on Paganism and Ethics, taken from an article I have had in my Book of Shadows for several years. The concept of ethics is one that I have spent much time thinking about, discussing, and teaching. I think all of us – Pagan and non-Pagan alike – could go far if we took a moment or two to consider the impact of ethics, morality, and behavior in our lives. So let’s take a closer look at these intertwined concepts of morality, behavior, and character that appear to define ethics. 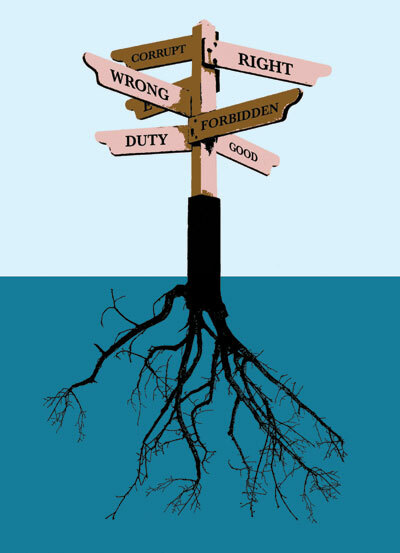 Morality often appears to have a divine component to it that pure legality does not. Many people think of morality in terms of “God’s” law, as opposed to legality which is “man’s” law. This is the position of orthodox Christianity, Judaism, and Islam. God defines morality and humans obey. And each of these tradition’s sacred texts, the Bible, the Torah, and the Qur’an respectively, are where one finds the specifics. In both of these examples humanity is absolved from any personal responsibility in determining ethical and moral behavior beyond obedience to God or to God’s word. This is not a functional paradigm in the Pagan world, where we find neither a sacred text to defer to, nor do we find God “out there” somewhere in an objective position independent from ourselves. Buddhism, a non-theistic tradition, provides us with an example of ethical and moral behavior without tying it to a concept of God or divinity. The basic Buddhist position can be stated in two parts: first, do not harm others and second, help others. Others include not only other humans but all sentient life. Some Buddhists schools of thought place more emphasis on the second part, helping others, than other schools do, but all emphasize the non harming aspect. To get more specific the Buddhist teaching of moral discipline includes the avoidance of the ten non-virtuous actions involving body, speech, and mind. The non-virtuous actions involving the body are killing, stealing, and engaging in sexual misconduct. Each of these things is very specifically defined. The non-virtuous actions involving speech are lying, harmful speech, divisive speech (meant to bring division between people), and gossip or idle speech. The non-virtuous actions involving the mind are harmful intent, ignorance (active repudiation of the central tenets of Buddhism), and coveting or desiring the wealth or possessions of another. From the Buddhist perspective it is imperative that one follow these if one is to succeed in attaining enlightenment. The strict mental discipline and meditation practices are not sufficient for it is believed that any gains realized through these practices are offset by the karma incurred from one’s engaging in non-virtuous behavior. Here we see a swing of the pendulum entirely the other way. Humanity is now held fully accountable for determining ethical and moral behavior. Even if one chooses to just follow the moral codes of Buddhism, there is still a fundamental difference. The Buddhist canon was developed utilizing human logic and reasoning whereas the Christian, Jewish, and Islamic canons are generally considered to be “revelations” from God. While not as explicit as the Buddhists’ ten non-virtuous actions, this still gives us something concrete that we can work with. It connects ethics and morality to behaviors that support life. Mr. Adams appears to be appealing to a basic sense of “goodness” within humanity and a confidence that that goodness will prevail.